Being a strict pescetarian, I try to find different ways of working in varied, exciting protein-rich plant foods to my dishes, wherever possible. 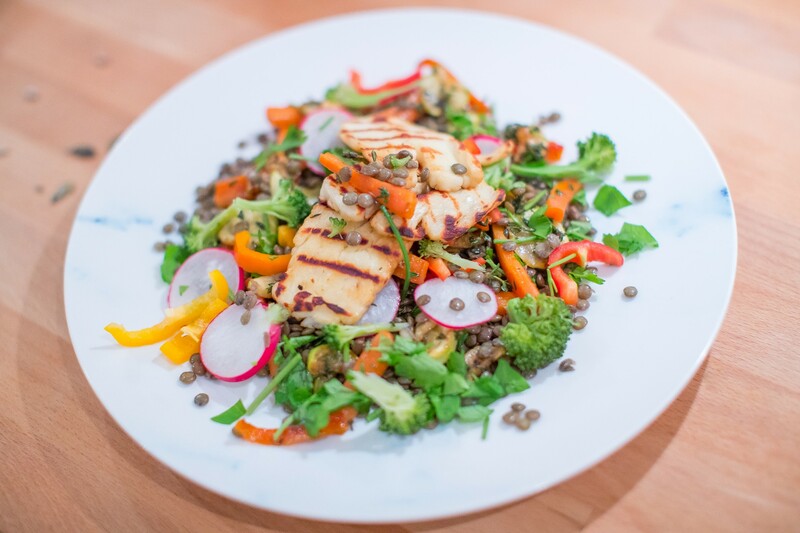 This salad ticks the protein box thanks to the lentils and that delectable ‘grilled halloumi’ topper. Combined with thyme and honey-roasted veggies, it tastes just a little reminiscent of something ‘Christmassy’, and absolutely delivers a hearty, filling experience that few salads can match. I dare you to take up the challenge of whipping this up for dinner during the coming week; get the full recipe by clicking MORE! Add the lentils to a pan of boiling water. Bring to a boil and then reduce to a simmer, cooking uncovered for 15-20 minutes, or until slightly al dente (but not mushy, you ideally want a bit of chew-resistance to the texture). Once the lentils are done, drain and set aside to cool. Meanwhile, add the finely chopped carrots to a bowl with the thyme and honey. Pop the ingredients on a baking tray and let them roast for circa 5 minutes. Once the lentils have cooled, combine them with the vegetables. Chop and add the rest of the veggies and plate up. Having griddled some halloumi, place your preferred amount on top and top with a sprig of parsley.